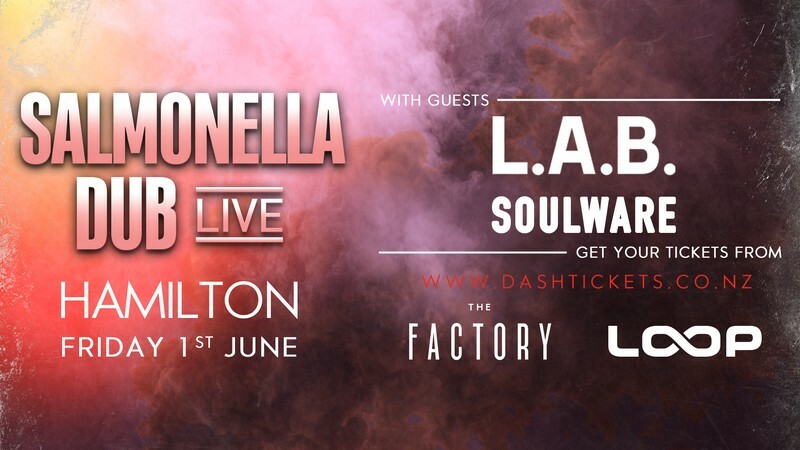 Salmonella Dub is bringing their live show to The Factory NZ for their first time, with friends L.A.B. and Soulware. Salmonella Dub’s impressive and very important place in New Zealand music history is undeniable - seven studio albums, three remix albums, a live album with the NZSO, four EP’s, and over 161 songs collectively achieving 10 x platinum across a catalogue that has sold over 600k worldwide, 270 + festival appearances, five Tui awards, and 12 bNet awards all proving testament to this band's iconic status. From their very first live appearance in 1993, creativity, energy, driving bass beats and pure joy are the signature hallmarks of one of New Zealand’s most successful bands. Founded by Brad and Stu Kora of Kora fame, L.A.B. also features Ara Adams-Tamatea, formerly of Katchafire, and Joel Shadbolt. Armed with a unique live sound that automatically fills any dancefloor, the band are on a meteoric rise within the New Zealand music scene. Their freshly-released debut album went straight to number one on iTunes, and is a unique blend of soulful-rock and electronic-funk, punctuated by exceptional melodies. Following its release, this is one electric performance not to be missed. The Factory NZ is Hamilton's newest entertainment venue located right in the heart of the South End CBD. The Factory combines the areas of the Outback Inn and the bar formerly known as Axces. This combined venue can now hold over 1,500 people, with new and improved world class stage design, sound and lighting production.